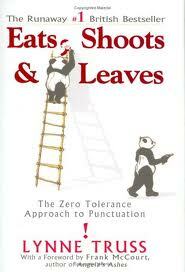 The last resource with which I teased my students today was a reference to a great book of several years ago, Eats Shoots and Leaves. It’s a very informative book which presents, in amusing fashion, some pointers on the appropriate usage of punctuation. It will run you about ten bucks, and will amuse you if you know punctuation, may startle you if you think you know punctuation, and will enlighten you if you are clueless as to punctuation.